Abstract: Each of the two double-sided 512MB PC3200 DDR DIMMs sports 16 TSOP-II DRAM modules which are cooled and protected by a sleek red heatspreader. Overclocking has become big business, and every day more people are joining the ranks. Manufacturers and resellers have recognized this fact, which is why you see enthusiast friendly gear all over the place. While the prices of mainstream & value oriented memory have been falling fast, high speed & low latency memory is still expensive because demand is high. With motherboard manufacturers allowing more voltage leniency, we're starting to see DDR2 speeds from traditional DDR memory. Top that off with tight latency timings and you have memory that overclockers will buy, no matter what the price! 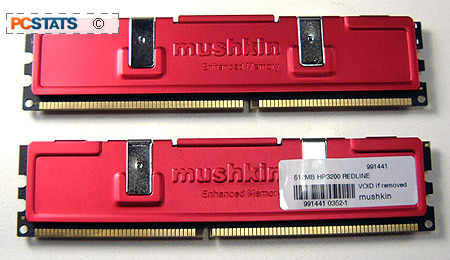 Mushkin is red hot right now, with its Redline memory modules gaining an impressive reputation. Today we're going to see how these modules actually measure up in our tests, and get an idea of how Mushkin is going to fare in the enthusiast arena. PCStats will be examining a 1GB dual-channel pack of Mushkin's HP3200 Redline memory (2x 512MB modules), and we're expecting some impressive results. Each of the two double-sided 512MB PC3200 DDR DIMMs sports 16 TSOP-II DRAM modules which are cooled and protected by a sleek red heatspreader. By default, the memory is rated to run at 200 MHz with 2-3-2-7 memory timings and a voltage of 2.7V. Default voltage is a bit high, but not out of the ordinary. If you'd like to learn a bit more about the Mushkin HP3200 Redline memory, check out its specs page. Neng Tyi must be doing well since almost every memory manufacturer is using the company's heatspreaders... At stock speeds and voltages, heatspreaders are mainly for show but at high speeds and voltages, they really do seem to make a difference. Mushkin sells it enthusiast memory direct to the public, and its 9.68 lifetime Reseller Rating should give potential buyers peace of mind. When I go shopping online, I always check out a store's Reseller Rating, and tend to avoid stores with ratings less than 9. PCSTATS tests DDR memory on AMD Athlon64 systems only because Intel is still in the middle of moving its platforms over to DDR2. Enthusiasts usually keep to the bleeding edge, so fast DDR memory is useless for the Intel overclocker. On AMD test systems, we're only interested in seeing how high we can go with the memory running 1:1, as running with other dividers puts the overclocking bottleneck elsewhere and not with the system memory. The DDR RAM latency must run at 2-2-2-5, or the memory's tightest possible timings, as quick access is more important to the CPU design. Just for arguments sake, we will also be conducting overclocking tests to see how high the memory will go with conservative timings (3-3-3-9), although we will only benchmark the system with the tight memory timings mentioned above. Let's get started! Pg 2. Overclocking Mushkin to the Redline!